*100% Net Ticket Proceeds go to Scott-Free Scholarship Foundation. This event will be a celebration of the launch of the WOAS RALEIGH 2013. There will be fine food, live music, live art presentations, wine, beer and cocktails. Everyone in attendance will be sure to have an amazing experience. Due to the extravagance of this event tickets are sold separately and are available for the public’s purchase. All net proceeds of the Masquerade Charity event will go to Scott-Free Foundation. In order to attend you must be 21 and older and have proof of ID at the door. 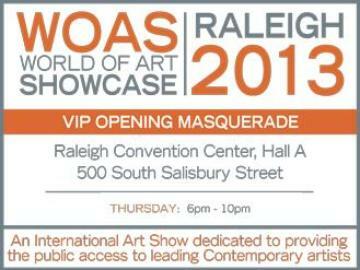 The Reception will be held at the Raleigh Convention Center in Exhibit Hall A, the location of WOAS RALEIGH 2013. Special Presentation: Scott-Free Scholarship Foundation will speak about their strides in providing at risk youth opportunities to explore and extend their talents and abilities. 21 or older. Must show proof of id for allowed entry.